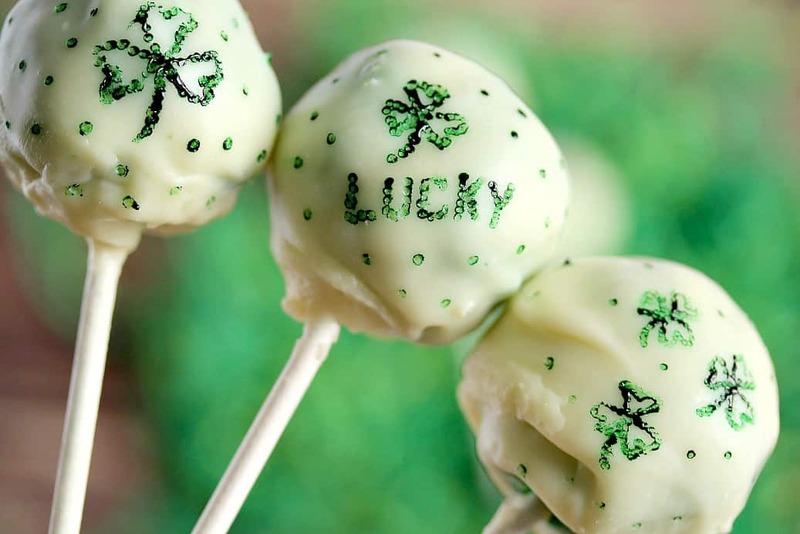 These Green Cake Pops are the perfect treat for St. Patrick’s Day celebrations! This post contains affiliate links for your convenience. See our Disclosure Statement for more information. Growing up we always celebrated St. Patrick’s Day with our extended family. I’m not even a teeny tiny bit Irish, but I still rocked the “Kiss Me, I’m Irish” pin every single year! Have you heard the expression that we are all a little bit Irish on St. Patrick’s Day? I am definitely a believer! It was a fun tradition to have as a kid, so I thought it would be fun to start new traditions with my own kids. 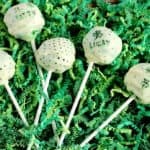 Nothing fancy, or big, just a little fun decor and a special treat – Green Cake Pops! Since making cake pops for the first time on Valentine’s Day, my oldest son has been asking me to make them again! 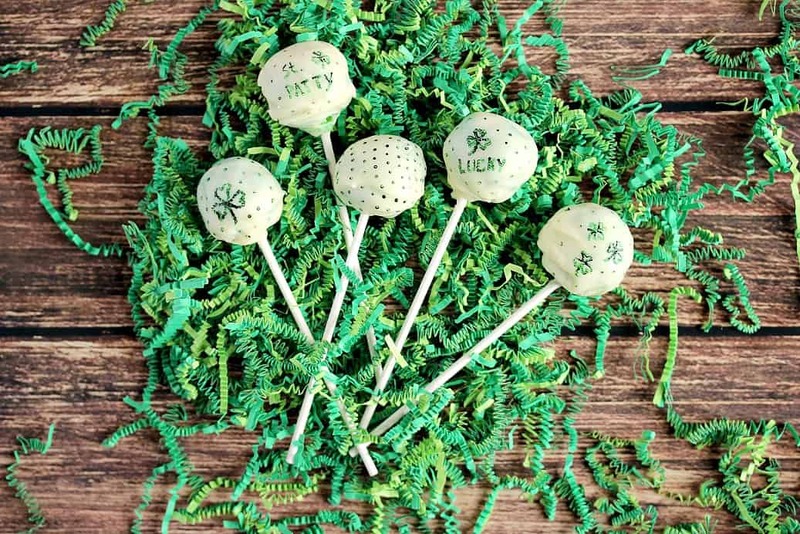 I thought it would be fun to make green cake pops, cover them in white chocolate, and then add fun St. Patrick’s Day designs on them. Making the cake balls is actually pretty easy. For this recipe I use a gluten free box of cake mix. I had no problems getting the cake to stick together to roll into balls with the brand of cake mix and icing that I bought. You can use a homemade recipe or regular box cake mix as well. There is no difference in the directions. Dipping them in the white chocolate can be a little tricky. I recommend using a small silicone brush to help spread the chocolate around. I use coffee mugs to keep the cake pops upright and not touch each other while the white chocolate is hardening back up. Decorating these Green Cake Pops gave me a bit of an unexpected challenge. The packet of green candy melts I bought to decorate them with turned out to not be the color green I was going for at all. I was worried I was going to have to scrap the entire recipe because of a lack of decoration! I finally decided to use green gel food coloring and a toothpick to create the designs. It was super easy and the shade of green is perfect! I’m really happy with the way the cake pops look and taste! Since the gel food coloring won’t harden, if you will be transporting them, I would recommend using extra vanilla icing dyed green and piping the decorations on instead. I like the look of the shamrocks and dots to fill in the white space, but you can add swirls and fun St. Patrick’s Day sayings as well! This St. Patrick’s Day inspired Green Cake Pops recipe is proof that sometimes you have to improvise – and it might just be better than the original plan! I guess you can say the luck of the Irish was on my side! 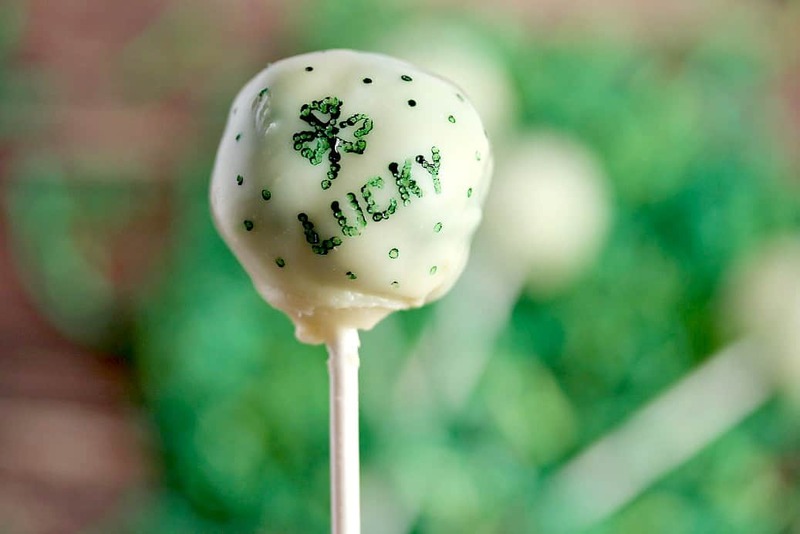 These Green Cake Pops are the perfect treat for St. Patrick's Day celebrations! Make your cake as you usually would but color the batter green before baking. After the cake has cooled, crumble it into fine crumbs in a large bowl. Add the vanilla cake icing a little at a time until the cake is just moist enough to be rolled into balls. The amount of cake balls will vary depending on how large you make them. I had 20. Place the cake balls in the freezer for at least an hour or two (they can be left in longer if needed). Once the cake balls are firm, place your white chocolate chips in a microwave safe bowl and cook on 50% power for a minute. Stir until smooth. If they are not melted enough, cook for another 15-30 seconds, then stir. Dip the end of the cake pop stick into the melted white chocolate and then insert it into the cake ball about half way. Dip the cake ball into the white chocolate and turn to coat. I like to use a silicone brush to help spread the white chocolate around better. Let the cake balls cool, upright (I put them in coffee mugs) not touching each other until set. Decorate as desired using the remaining icing dyed green or green gel food coloring and a toothpick as I did. You are so talented! I love how you decorated these cake pops. They’re so pretty! These are such a fun idea, I love how bright they are! Well, I am Irish, even a bit more on St. Pat’s Day! These would make a nice dessert for the occasion. These are so fun! My kids LOVED them!! I love the toothpick/gel food color decoration – completely inspired MacGuyver solution and it looks fantastic! I want to make cake pops soon. I love eating them but have yet to try my hand at making some. Thank you so much! I was so glad it worked out! You should definitely make cake pops sometime! They are soooo good! !